The Syrian army says the strikes killed six and caused "extensive material damage"
Thank you for following our live coverage of the first US military strikes against the Syrian government. The BBC will continue to follow the story. And below, a look at some of the questions that will be asked in the days and weeks ahead. Video caption: What is Trump's plan in Syria?What is Trump's plan in Syria? The Russian Defence Ministry has denied reports in US media that the line of communication with the US in Syria remains open. A statement says that today a note was sent to the Pentagon from the Russian Defence Ministry through military-diplomatic channels, informing them of the termination of the "hotline" communication channels established by the 2015 memorandum. In addition, the US military attache was called to the Defence Ministry this evening, and officially handed the same note - informing him that from midnight tonight, the Russian side was pulling out of the deal. This was the memorandum establishing the communication channel to exchange information and prevent incidents in the skies over Syria. Israeli Prime Minister Benjamin Netanyahu said he supports the "strong and clear message" sent by the US missile strike in neighbouring Syria. "In both word and action, President Trump sent a strong and clear message today that the use and spread of chemical weapons will not be tolerated," a statement from Netanyahu's office said. "Israel fully supports President Trump's decision and hopes that this message of resolve in the face of the Assad regime's horrific actions will resonate not only in Damascus, but in Tehran, Pyongyang and elsewhere." One Twitter commentator has cautioned the Prime Minister that unlike Syria, Iran or North Korea may actually shoot back. The BBC's Daisy Walsh is covering Donald Trump's visit to Mar-a-Lago, Florida. She's taken some time to speak to Florida voters about Trump's actions in Syria. A Pentagon official tells the BBC that the US will be paying closer attention to Syria's weapons arsenal due to the recent developments. In 2013, Russia and the US reached a deal in which Syria chemical weapons would be removed from the country. But apparently that has not happened. "We collect intel on lots of aspects of the Syrian military, of course. We want to know their military activities," the official says. "Looking for chemical weapons is something that's always in the portfolio. "Because we had trusted the Russian guarantees that they had removed those capabilities, that was not at the top of our list." Now, he said, "that moves up the list". "I’m not going to get into future actions," White House spokesman Sean Spicer says from Florida, where Donald Trump is spending the weekend. "He’s not going to telegraph his next move. This action was decisive, justified, and proportional to the actions he felt needed taking." He also said that the president told his Chinese counterpart of the strikes as their dinner together was concluding, but before he had been fully briefed on their result. “The impact occurred at around 8:30 last night eastern time. The president informed President Xi as dinner concluded and he was on his way back to his temporary quarters. So, where the exact timeline is, I don’t know. But my understanding is that everything had made impact by the time he was informed - he informed President Xi,” Mr Spicer said. "I think if you’ve seen the response from the world community they understand that the US acted appropriately and in most cases there is widespread praise for the president’s actions," he added. MSNBC's Brian Williams has been criticised for calling the US Tomahawk missiles "beautiful" several times in less than 30 seconds during last night's broadcast. Twitter users have expressed outrage over the poor choice of words, but others have been more forgiving. The presenter was fired from his NBC show in 2015 after he falsely claimed to have been in a helicopter in Iraq when it was hit by a missile. Russia has accused America of encouraging "terrorists" with its unilateral actions. Russia's deputy ambassador to the UN, Vladimir Safronkov, told the session that the US military's "illegitimate" missile strikes had encouraged "terrorists" in Syria. "When you take your own path, this leads to horrible tragedies in the region," he said, addressing the US. His comments echo earlier statements from Syrian and Iranian officials. The Florida summit began with President Trump's grandchildren singing a Chinese song to President Xi and his wife, but even before the dinner plates were cleared, the host had created an awkward challenge for his guest. China's position on Syria is much closer to Russia's than to the US. And the Chinese government will guess that the timing of the American missile strike was a blunt message that without more robust Chinese help on dismantling Kim Jong-un's nuclear programme, the next target for pre-emptive American military action might be North Korea. In Chinese protocol, sudden moves disrupting set piece occasions are avoided wherever possible, and in private, President Xi is likely to be angry that President Trump chose to strike on the very night of his visit. But in public Xi stuck to his script about the virtues of co-operation while Trump insisted they'd formed an outstanding relationship and made great progress. As the two presidents went into their final lunch there were no specifics, and in the aftermath of the US missile strike on Syria, all the big questions which bedevil the US China relationship have be kicked down the road for President Trump's visit to China later this year. "The United States took a very measured step last night", ambassador Nikki Haley tells the UN Security Council. "We are prepared to do more," she adds before yielding the floor to the representative of Syria. Senior US military officials just held an off-camera briefing, attended by the BBC's Suzanne Kianpour . Officials, who did not wish to be identified, said reports that the so-called "deconfliction" phone line with the Russians has been stopped is false - despite the Russian embassy in Washington tweeting that it had been cut. "That line is still open. We’re still actively using – and there’s someone still on the line," officials said. One official also disputed a Russian report that all 59 missiles did not hit Al Shayrat airfield. He told the BBC: "We are very positive all our missiles reached their target." The US military is investigating Russian involvement in the chemical attack. While they have no knowledge of any such involvment at the moment, they added: "but we're not done". They said they are now looking more aggressively at Syria's chemical weapons program. The UK's former foreign secretary, Sir Malcolm Rifkind, said he believes the US air strike makes it more likely that Russia will pressure the Syrian government into negotiating a political solution to the country's ongoing civil war. He said the Syrian government had felt it was winning until now. "The Russians and Assad have said we might as well keep this war going because every week, every month we control more territory, so that when negotiations do eventually begin Assad will already control most of the country," Sir Rifkind said. "He cannot now make that assumption." Ahmed, a Syrian refugee now residing in the US state of Pennsylvania, just got off the phone with BBC News. Q. Do you have family remaining in Syria? "My parents are both in Syria. They live in a town 50km outside Aleppo. They are married. I have six daughters total. I have three daughters in Turkey." Q. How do you feel about the suspected chemical weapons attack? "Seeing the victims of the chemical weapons attack was difficult. Where is the interaction from the international community? Why didn't they do anything to stop the massacres? Trump's decision is welcomed by Syrians because we hope he will remove Assad." Q. 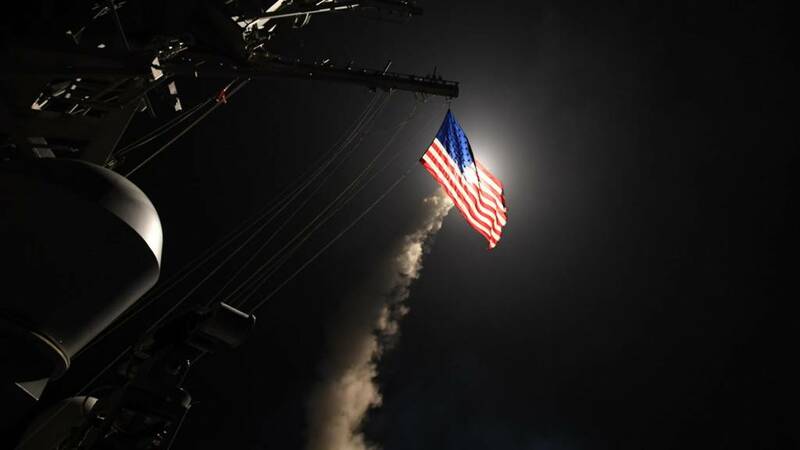 What do you think of the US strikes? "I do not think this one strike will, or can, change anything. We saw the Russians' reaction was more air strikes. We thank the US government. I hope to be reunited with my family in America. I hope Trump opens the door to refugees." Q. How has the war affected your family? "Many people including my family have immigrated out of Syria such as to Turkey and Lebanon because of the situation. I hope the international community will do something." The UN Security Council is meeting to discuss the US missile strikes on a Syrian airbase from which Washington believes a chemical weapons attack was launched. The British ambassador to the UN, Matthew Rycroft, said the attack was a signal to Syrian President Bashar al-Assad that time was running out for him. "The United Kingdom supports the US air strike on al-Shayrat airfield because war crimes have consequences and the greatest war criminal of all, Bashar al-Assad, has now been put on notice. "The US strike was a proportionate response to unspeakable acts that gave rise to overwhelming humanitarian distress. "It was also a strong effort to save lives by ensuring that such acts never happen again."